^ a b "Paul Walker Leaves Entire $25 Million Estate to Daughter". People. February 4, 2014. Retrieved March 8, 2017. ^ a b Weisman, Aly. "Paul Walker Left His Entire $25 Million Estate To His 15-Year-Old Daughter — But Things Could Get Messy", Business Insider, published April 2, 2014. Retrieved May 11, 2015. ^ WGN News at Nine. Chicago, IL. November 30, 2013. Event occurs at 21:32 CST (32 minutes). WGN-TV/WGN America. ^ "Paul Walker – Biography". The New York Times. Retrieved March 4, 2014. ^ Eggenberger, Nicole (December 2, 2013). "Paul Walker Said Daughter Meadow Encouraged Him to Keep Acting". Us Weekly. Retrieved October 10, 2017. ^ Gicas, Peter (December 2, 2013). "Paul Walker's Cologne Ad Airs During UK Soccer Game, Sparks Outrage". E! Online. Retrieved October 10, 2017. ^ Suebsaeng, Asawin (April 2, 2015). "Paul Walker's True Passion: Whatever Happened to Walker's Disaster-Relief Rescue Squad?". The Daily Beast. Retrieved October 10, 2017. ^ a b Hobson, Louis B. (June 17, 2001). "Paul Walker kicks it into high gear". Canoe.ca. Retrieved December 5, 2013. ^ a b c Keck, William (September 27, 2005). "Fame lets Paul Walker dive in". USA Today. Retrieved December 3, 2013. ^ Atkin, Hillary (June 6, 2003). "Walker's in the 'Fast' lane to film stardom". USA Today. Retrieved December 3, 2013. ^ "Stars React To Paul Walker's Death, Other Crash Victim Identified". CBS Los Angeles. December 1, 2013. Retrieved December 3, 2013. ^ "Paul Walker Bio: Fast & Furious Actor". Tribute. Tribute Entertainment Media Group. Retrieved December 3, 2013. ^ Youtube. "Showbiz Pizza Commercial". Retrieved July 3, 2012. ^ "Eight Below (2006)". Box Office Mojo. Retrieved September 28, 2008. ^ a b Murray, Rebecca. "Interview with 'Running Scared' writer/director Wayne Kramer". About.com. Retrieved September 28, 2008. ^ "Apple – Movie Trailers – Fast and Furious". Apple. Retrieved September 28, 2008. ^ Fleming, Michael (September 9, 2008). "Screen Gems digs up 'Bone' cast". Variety. Retrieved December 3, 2013. 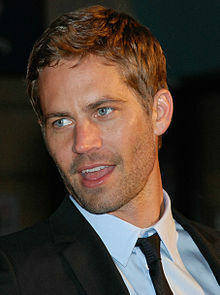 ^ "Coty Prestige Announces Agreement with Paul Walker". PR Newswire. January 14, 2011. Retrieved December 3, 2013. ^ Trumbore, Dave. "Paul Walker Leads HITMAN Reboot in AGENT 47". Collider. Retrieved December 3, 2013. ^ Koltnow, Barry (February 18, 2006). "Just chillin'". The Orange County Register. Retrieved December 3, 2013. ^ Gilbey, Ryan (December 1, 2013). "Paul Walker obituary". The Guardian. UK. Retrieved December 5, 2013. ^ Smith, Grady (December 1, 2013). "The sides of Paul Walker you may have missed". Entertainment Weekly. Archived from the original on December 1, 2013. Retrieved December 1, 2013. ^ Tate, Amethyst (December 2, 2013). "Who Is Jasmine Pilchard-Gosnell? Paul Walker's 23-Year-Old Girlfriend Mourns Actor With Family After Fatal Car Crash". International Business Times. ^ "Meadow Walker, Paul's daughter inspired him to continue acting; Fast and Furious star on being Christian". Christian Today. December 2, 2013. Retrieved August 5, 2016. ^ Duane, Daniel (September 6, 2005). "Paul Walker's Adventure Sports Workout Routine". Men's Health. Retrieved December 3, 2013. ^ "Paul Walker receives BJJ Black Belt at Memorial". Bjpenn.com. December 9, 2013. Archived from the original on December 12, 2013. Retrieved December 10, 2013. ^ Arnold, Catherine (September 25, 2006). "Paul Walker and Marine Biology: Foundation Presents Marine Awards". Nature World News. Retrieved March 8, 2013. ^ "Paul Walker Leads Shark Expedition". Starpulse.com. November 12, 2009. Archived from the original on April 26, 2010. Retrieved November 15, 2009. ^ "Actor Paul Walker Joins National Geographic Shark Expedition". DiverWire. November 13, 2009. Archived from the original on December 3, 2009. Retrieved November 15, 2009. ^ "Expedition Great White". National Geographic. Archived from the original on November 16, 2012. Retrieved November 15, 2009. ^ "REACH OUT Worldwide". REACH OUT Worldwide. ^ "AE Performance". Redline Time Attack. Archived from the original on March 22, 2010. ^ "Paul Walker, estrella de "Rápidos y furiosos" falleció en accidente de tránsito". El Comercio. ^ "Suit Over Paul Walker's Car Collection Settles". NBC Southern California. Retrieved August 6, 2018. ^ "A Look Inside Paul Walker's Garage [Photos]". Motor1.com. Retrieved August 14, 2018. ^ "Paul Walker - A True Car Enthusiast". BMW BLOG. April 6, 2015. Retrieved August 14, 2018. ^ "Take a tour of Paul Walker's car collection". Autoblog. Retrieved August 6, 2018. ^ "Walker and Rodas, you will be missed". Motor Sport. December 1, 2013. Retrieved December 2, 2013. ^ "Call to Action". Merrill Lynch. Archived from the original on December 2, 2013. Retrieved November 30, 2013. ^ "Rodas: Racer, manager, friend to Walker". December 3, 2013. Retrieved June 20, 2014. ^ Smith, Perry (November 30, 2013). "Paul Walker, Santa Clarita CEO Reportedly Killed in Fatal Single-Car Crash". KHTS Radio. Retrieved November 30, 2013. ^ "Vin Diesel Reacts to Paul Walker's Death: 'I Will Always Love You'". The Wrap. Retrieved August 12, 2014. ^ "Paul Walker death: Vin Diesel's touching Facebook post about how he lost his 'other half'". The Mirror. ^ a b Duke, Alan; Sutton, Joe (November 30, 2013). "'Fast & Furious' star Paul Walker killed in car crash". CNN. Retrieved November 30, 2013. ^ a b "Autopsy blames impact and fire for actor Paul Walker's death". CNN. December 4, 2013. Retrieved December 18, 2013. ^ Wood, Daniel B. (December 4, 2013). "Paul Walker crash could 'romanticize' growing street racing culture". The Christian Science Monitor. Retrieved December 7, 2013. ^ "Speed may have been factor in Fast and Furious star Paul Walker's crash". Sunday Morning Herald. January 4, 2014. Retrieved January 4, 2014. ^ ""Fast & Furious"-Star : Walker-Auto war fast 100 Stundenkilometer zu schnell". Die Welt (in German). January 4, 2014. Retrieved January 4, 2014. ^ "Paul Walker death investigation: Police rule out second vehicle, focus on speed". CNN. Retrieved December 2, 2013. ^ Duke, Alan (March 26, 2014). "Investigators: Speed – not drugs, racing or mechanical failure – killed Paul Walker". CNN. Retrieved March 26, 2014. ^ Gonzalez, Maricela. "'Fast & Furious 7' production halted after Paul Walker's death". Entertainment Weekly. Retrieved December 5, 2013. ^ "'Speechless' Vin Diesel pays tribute to Paul Walker". The New Zealand Herald. Auckland. December 2, 2013. Retrieved December 2, 2013. ^ "Paul Walker has been Buried at The Forest Lawn Memorial Park Cemetery in the Hollywood Hills Today". Allvoices.com. December 4, 2013. Archived from the original on January 14, 2014. Retrieved December 18, 2013. ^ CNN, Brian Lowry. "'I Am Paul Walker' brings more nostalgia than depth to actor's life". CNN. Retrieved 2019-03-21. ^ Zuckerman, Esther. "Paul Walker's dad files claim against estate of driver in fatal car crash". Entertainment Weekly. Retrieved January 8, 2015. ^ Bever, Lindsey (September 29, 2015). "Paul Walker's teen daughter sues Porsche over his death in fiery crash". The Washington Post. ISSN 0190-8286. Retrieved January 7, 2016. ^ "Porsche Blames Paul Walker For His Own Death". www.yahoo.com. Retrieved November 17, 2015. ^ a b Child, Ben (April 6, 2016). "Judge rules Porsche not to blame for Paul Walker's death". The Guardian. Retrieved April 6, 2016. ^ D'Zurilla, Christie (October 25, 2017). "Paul Walker's daughter settles with Porsche in wrongful-death suit". Los Angeles Times. Retrieved June 6, 2018.